Eric Clapton (born Eric Patrick Clapp in Ripley, Surrey, England on 30 March 1945), nicknamed "Slowhand", is a Grammy Award winning English composer, singer and guitarist who became one of the most respected artists of the rock era, winning three inductions into the Rock and Roll Hall of Fame. 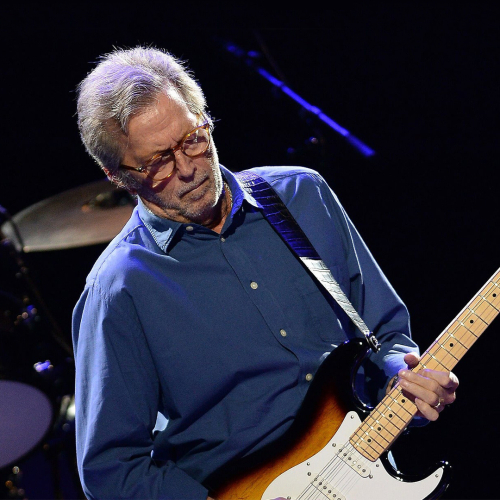 Clapton's musical style has changed during his career, but has remained rooted in the blues. Clapton is credited as an innovator in several phases of his career, which have included blues-rock with John Mayall & the Bluesbreakers and The Yardbirds (1963-1965), early single hit "Come With Me" by The Roosters, blues-hard rock (with Cream), and work as a sideman and a solo artist; he has achieved chart success in genres ranging from Delta blues (Unplugged) and psychedelic rock (Sunshine of Your Love) to pop (Change the World) and reggae (I Shot the Sheriff). Eric Clapton was a friend of George Harrison of the Beatles. It is believed that he wrote Layla about Harrison's wife, Pattie Boyd, whom he married in 1979 after she divorced George Harrison. They divorced in 1988. Eric Clapton has also dated singers Marianne Faithfull and Rosanne Cash, actresses Patsy Kensit and Sharon Stone, and rock muses Cynrinda Fox and Geraldine Edwards, who was one of the inspirations for Penny Lane in Almost Famous. He is now married to Melia McEnry and has been since 2002. They have three daughters together. Clapton formed relationships with different artists in his career. From his start in The Yardbirds, then journeying forward to Cream, John Mayall and the Bluesbreakers, Derek and the Dominos, he is an extremely gifted musician. Clapton would go on to play lead guitar in Roger Waters' first solo album, The Pros and Cons of Hitchiking. All this while compiling hit after hit in his solo career, has made Clapton one of the most enduring guitarists of the classic rock era. "Tears in Heaven" was written after his son's tragic death. It was co-written with Russ Titelman and acknowledged with a Grammy in 1993. Most recently, Eric Clapton has organized a benefit concert in honor of Hubert Sumlin, the great bluesman, that took place at the Apollo Theater in New York on February 24, 2012. He was joined by Jeff Beck, Keb Mo, Levon Helm, and Derek Trucks among others. Clapton is known to sponsor an array of charitable events and concerts. He has also established a rehabilitation clinic in Monserrat to help those with substance abuse problems. 'Clapton' was released on September 27, 2010 by Reprise. A live album titled Play The Blues Live At Lincoln Center performed with Wynton Marsellis was released on September 13, 2011 by Reprise. Early 2013 saw the release of 'Old Sock', an album of 10 cover songs and two new originals, which was met with mixed reviews, some saying that it was lazy and unnecessary ("little commitment to the music here and even less enthusiasm") whilst others appreciated the mastery he still exhibits over his craft ("winding down a legendary career with his typical class, reverence to the past and master’s touch"). Eric Clapton is highly regarded as a premier musician, and continues to remain a force in music today.